Multilateral development agencies have increasingly focused on underdeveloped Asian countries as potential new sites for financial capital. Often referred to as ‘emerging markets’, these economies are seen as ripe for private sector investment and, at the same time, in need of foreign capital to support rapid industrialisation, modernisation and poverty reduction. This confluence of interests suggests a means for quickly closing the ‘development gap’, primarily through mobilising regulatory, institutional and governance reforms designed to reduce barriers to foreign capital, institutional inefficiencies and risks to investment, capital repatriation and market operation. Therefore, development agencies now encourage the construction of ‘enabling environments’ to support ‘market driven development’ through processes variously identified as ‘financialisation’, centring on the role of the market and private capital. While the state itself has historically occupied a central place in economic development, new financialised modes of development are increasingly marginalising the state, its influence in the economy and thus its ability to manage developmental outcomes. 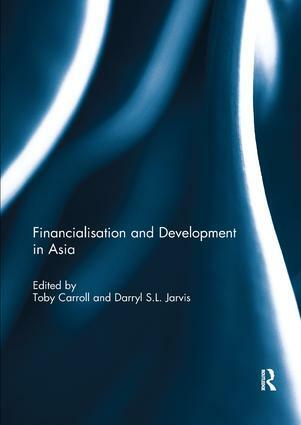 In this volume a collection of leading authors critically assess these developments, highlighting the emergence of financialised modes of development and their contested and often problematic nature. Drawing upon a series of case studies, the contributors explore not just the increasing use of financialised development initiatives, but assess critically their implications in terms of the emergent risks, costs and inequalities that often accompany them. This book was originally published as a special issue of the Asian Studies Review. Toby Carroll is an Associate Professor in the Department of Asian and International Studies at the City University of Hong Kong, Hong Kong. His most recent books include Delusions of Development: The World Bank and the Post-Washington Consensus in Southeast Asia, and (edited with Darryl Jarvis) The Politics of Marketising Asia. Darryl S.L. Jarvis is Professor and Associate Dean, Faculty of Liberal Studies and Social Sciences at the Hong Kong Institute of Education, Hong Kong. He has published widely in the areas of international relations, regulatory politics and the political economy of investment issues in Asia. His recent publications include (with Toby Carroll) The Politics of Marketizing Asia; and (with Anthony Welch) ASEAN Industries and the Challenge from China.